Show Mom, Mother, Momma LOVE! | J.O. Spice Company Inc. Depending on where you live, the term might vary but the meaning is the same: Mom, Mother, Momma = Love! No matter who you are, a Mom can be biological, adopted or “like a Mom” and showing your love, appreciation, and gratitude is so easy to do at J.O. Spice! We have the gifts that say the right sentiment. We also have the power to make the right sentiment happen! Instead of Momma, do you call her Mams? 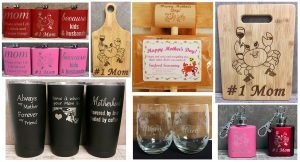 We can personalize that on a glass or cutting board. Is there a favorite place that evokes special memories like a visit to the beach or sitting on a lawn chair overlooking the sunset, eating crabs? J.O. Spice’s graphic designers can make magic happen with just a little time and a lot of thoughtful creativity. It all happens at J.O. Spice. 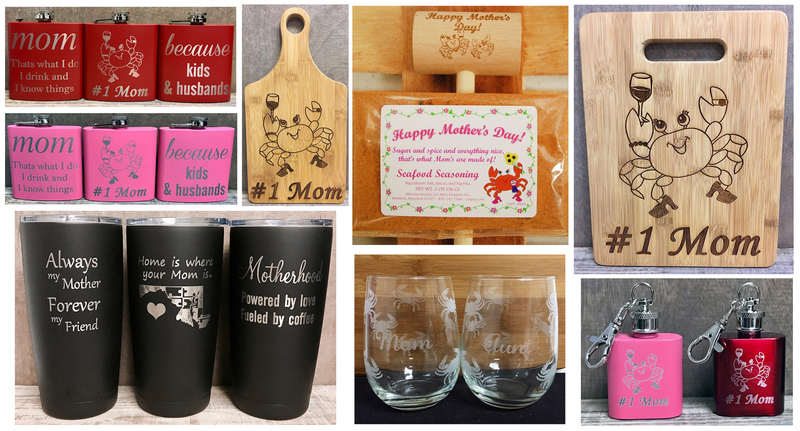 This Mother’s Day, show your love with a pre-custom cutting board, glass or keychain flask. Mom’s are #1 at all times! There’s also J.O.’s brand new Tumblers that have been pre-customized with popular sayings like “Always my mother, always my friend,” or “Home is where your Mom is (adorned with a heart)” that keep the liquid cold or hot up to 24 hours! The J.O. Spice Retail Store is a cute gift boutique nestled among an industrial park. Whenever people “find” the store, they exclaim they never knew it was here. Located behind a trucking company and a popular fast food chain sits the manufacturing plant and the store. The doors are clearly marked: Employee Entrance is the first set of doors to see and further down the parking lot is the Retail Store. With hours Monday – Friday from 7:30am – 4:30pm and sometimes the occasional late night or early Saturday depending on the season, and an ever-available online store, there is always a way to get crab spice, seafood seasoning, or that perfect gift. The owners motto: Customer Service is our #1 Priority and most often it is them you see when you walk in the door! If they don’t have it readily available, they call the plant or deliver it to you as soon as they can get it made for you. They treat you like family and it shows in their customer service. Great customer service is what you want when shopping for a special gift for Mom, Mother, Momma, especially on a busy Mother’s Day holiday. When you come into J.O. Spice, you feel the love we have for all of our Mother’s as well as the love we have for making sure you find that perfect gift – for whenever the occasion. When you feel love, you spread love. That makes the world a better place. J.O. Spice is doing our part to make the world a better place, one shopping experience at a time. Basically, come to the J.O. Spice Retail store and just live better. It also might be the spice that makes life so much better but that’s another article! This entry was posted in Product Highlight. Bookmark the permalink.